View basket “Viscose Jersey Dress Fabric – Forest” has been added to your basket. What is Viscose Jersey Fabric? Our Viscose Jersey consists of viscose combined with elastane to give some stretch for comfortable wear. 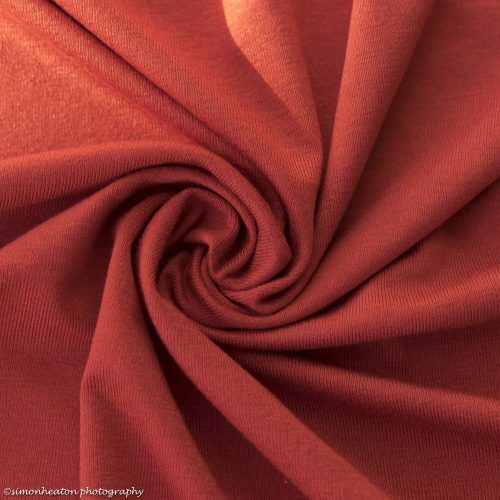 Viscose is a semi-synthetic, man-made fabric comprised of natural fibres. The regenerated cellulose fibres are usually made from wood pulp or the woody parts of the cotton plant. Any tips for sewing Viscose Jersey? This fabric sews easily and there is no need to finish or overlock the seams as this will stretch the fabric too much. It is an interlock which means the edges don’t roll but stay flat which makes it great to work with. Make sure you stay-tape necklines, armholes and shoulders before sewing them together. This fabric drapes beautifully and is soft to the touch. Because of this it makes lovely dresses, skirts, shirts, blouses and tunics. Machine wash at 30 degrees and then it won’t need ironing as it is unlikely to crease. We wouldn’t recommend tumble drying this fabric as this can damage the fibres and shrink the fabric, simply spin and hang to dry. We stock a lovely selection of Viscose Jersey fabrics – plain colours from subtle pastels to jewel bright shades, and some beautiful prints.